Direction (Q. 1 – 5): Following pie–charts show the percentage distribution of job vacancies in IT industries in the year 2000 and 2010. In the year 2000, the total number of vacancies was 5.4 lakh, and in the year 2010, it was 8.6 lakh. 1. What is the difference between the number of vacancies available in Bangalore in the year 2010 and 2000? 2. What is the average number of vacancies available in Hyderabad in the year 2000 and 2010? 3. 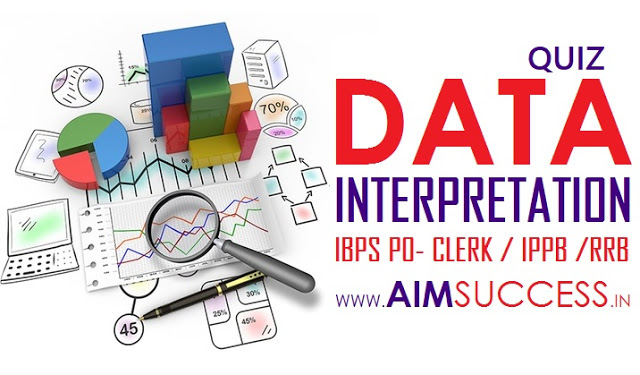 What is the total number of vacancies available in Chennai in 2000 and in Mumbai in the year 2010? 4. If the number of vacancies in Pune is 48000 in the year 2010 and the percentage distribution is the same as given in the chart, what is number of vacancies available in NCR in 2010? 5. What is the percentage rise in vacancies available in Hyderabad from year 2000 to 2010? (Give approximate value only). Directions (Q. 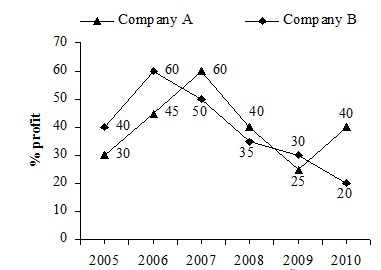 6-10): In the following line-graph, the percentage profit earned by two companies A and B during the period 2005 to 2010 is given. 6. What is the percentage increase in the per cent profit of Company A from the year 2006 to 2007? 7. If the incomes of Company A and B are equal in the year 2007, what is the ratio of the expenditure of A to that of B? 8. If the income of Company A in 2009 and the expenditure of Company B in 2010 are equal and that are ₹ 90 lakh each, what is the difference between the income of B in 2010 and the expenditure of A in 2009? 9. If the income of Company A in the year 2010 and the expenditure of Company B in the year 2005 are ₹ 98 lakh and ₹ 85 lakh respectively, what is the sum of the expenditure of A in 2010 and the income of B in the year 2005? 10. The expenditure of Company B in the year 2006 is what percentage of its income in that year?